Cristiano Ronaldo scored five in Real Madrid CF's 9-1 win against Granada CF before FC Barcelona re-established their four-point lead at the top by edging RC Celta de Vigo 1-0. 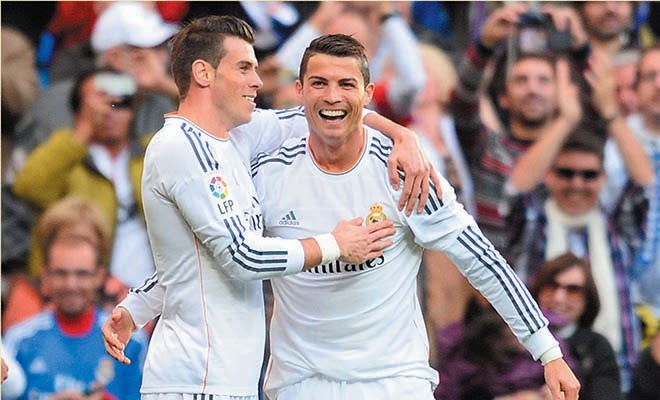 Real Madrid CF score nine for first time since 1967 with 9-1 success v Granada CF. • Cristiano Ronaldo hits five, including an eight-minute hat trick, taking his Liga tally to 36. • Karim Benzema registers twice, after Gareth Bale opens scoring. • The capital side become first Liga team to post nine since FC Barcelona in 1979. Barcelona respond with fifth straight win at RC Celta de Vigo. • Jérémy Mathieu nets winner on 73 minutes, restoring Barça's four-point lead. • Fabián Orellana sent off for Celta with three minutes remaining. • Valencia CF could not find a way past Villarreal CF, a 0-0 draw meaning they stay fourth. • Getafe CF beat RC Deportivo La Coruña 2-1 to pull away from relegation zone.